Mutual divorce deed in Pakistan is a deed of divorce on which both the husband and wife are agreed. Whenever a husband divorce in Pakistan is not unilateral and both the husband and wife are agreed to get separated and get divorce in Pakistan the mutual divorce deed in Pakistan can be prepared. The first thing which requires to be done is to issue a stamp paper and write the contents of divorce on it. If you are well acquainted with the law you can get it prepared yourself however better to contact a lawyer because he knows well what to write. The contents of mutual divorce deed in Pakistan are very much important because you never know that when your other partner get angry and approaches the court. If such thing happens then the contents of the mutual divorce deed can be used against the other in the court of law. Divorce deed format in Pakistan are available online but every case is different in Pakistan and every time you need contents as per your own case so if you wish to draft divorce deed in Pakistan better to leave the job to a profession lawyer who can draft a divorce deed in Pakistan for you as per your requirement. Once you are done with the mutual divorce deed in Pakistan the divorce procedure in Pakistan will be followed. Mutual divorce deed in Pakistan is the first step in initiating the procedure of divorce in Pakistan. Mutual divorce deed in Pakistan is prepared only when both the wife and husband is ready to get divorce. Most of the people think that once they are done with the mutual divorce deed their divorce is done which is incorrect. Even the divorce is mutual still they have to go through the divorce procedure in Pakistan and they will be husband and wife till the divorce certificate is issued. This divorce certificate in Pakistan from Nadra. It is better to be precise while preparing a mutual divorce deed in Pakistan and avoid other matters involving in it. Most of the people decide their children, maintenance etc in the divorce deed which is wrong. The divorce in Pakistan is separate issue and the child custody and maintenance etc are separate issue. Better to deal all issues separately. There is no bar in mentioning the child custody and maintenance stuff in the divorce deed but better to leave this thing because one wrong statement can used as evidence against the other. Whenever a family case comes to the court the most discussed material as evidence is the divorce deed. A lawyer for a party discuss the wordings of divorce deed and each lawyer tries to draw his own inference out of it so instead of going in to technicalities better to hire a lawyer and ask him to prepare mutual divorce deed for you. A lawyer can not only prepare divorce docs for you but can also get to the divorce certificate within reasonable times. You can also contact our law firm Nazia Law Associates for preparing a mutual divorce deed and along with a help to get you divorce certificate in Pakistan. 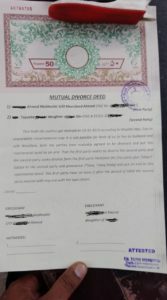 Mutual divorce deed sample Pakistan can be checked in image.